With oral arguments on California’s Prop 8 and DOMA concluded at the Supreme Court, I’d just like to note how encouraging it is to think that, no matter the outcome of these cases, within a decade or two, visiting a website like the National Organization for Marriage will be as uncomfortable as visiting the website of the KKK. Their hate is dressed in a thin veneer of civility and open-mindedness. Much like the KKK, NOM professes to respect the group against which it discriminates. NOM advocates a federal constitutional amendment to ban gay marriage, which would be the only amendment in our history–besides prohibition–designed to restrict citizens’ rights. * It’s nice to live in a country (and thankfully not the only one) where that kind of thinking looks doomed to marginalization, though more slowly than it should be. *The 16th Amendment doesn’t count. In favor of guns and body scans? As the political implications of the Sandy Hook shooting begin revealing themselves and my inner gun skeptic burns with righteous indignation, I’ve become concerned with a possible hypocrisy in my professed views on civil rights that I likely share with some readers. The U.S. has more assault-related deaths per capita than every other OECD country, and we also tend to have laxer gun control. Nearly 300,000 Americans died from gunshots in the 2000s. We’re replete with semi-automatic weapons and high-capacity ammo clips (both of which were used at Sandy Hook), gun shows that distribute firearms without background checks, and right-to-carry laws that permit citizens to carry weapons in public. But post hoc ergo propter hoc is a fallacy, and the evidence for causation between gun control and lower gun violence is mixed. States with stricter laws tend to have lower rates of gun violence, but the connection is quite weak (as one might expect given the ease of transporting weapons across state lines). International comparisons are very difficult given the preponderance of variables that need to be controlled for, from economic factors and education to mental health services and criminal justice procedures. And while I find it intuitive that fewer, better regulated, and less powerful guns should lead to fewer gun deaths, it’s difficult to mount an ironclad case against a gun proponent’s intuition that, say, armed citizens can better protect themselves against armed criminals, and–most importantly–that determined criminals will find weapons regardless of regulations. That last point is the disconcerting one for me, because it sounds much like the argument I make against the Transportation Security Administration: Determined terrorists won’t be thwarted by wimpy airport security procedures; they’ll find a way to cause damage. And while it’s difficult to demonstrate the counterfactual, the TSA has yet to produce evidence that they have prevented any terrorist attacks, which I find quite sufficient reason to be fed up with their curiously horny reign of anti-terror. In particular, I’m concerned that TSA procedures violate my Fourth Amendment rights (though the courts seem to disagree with me). Perhaps there is at least a slight difference in the likely consequences of regulation in the two scenarios–because while TSA screening exacts real costs in the form of security line delays, children’s tears, and stolen iPads, it’s hard for me to believe that increased regulation of semi-automatic weapons would cause much practical inconvenience for people who don’t want to commit mass murder (despite some gun advocates’ paranoid predictions of unchecked tyranny over a defenseless citizenry). That is, even if gun control doesn’t effectively prevent gun crime, at least it probably won’t lead to the sexual harassment of six-year-olds. But that’s not an entirely satisfying consolation. I’ll try to avoid saturating this blog with politics, both because I get enough of that at my job and because you probably get as much of it as you want in other places. 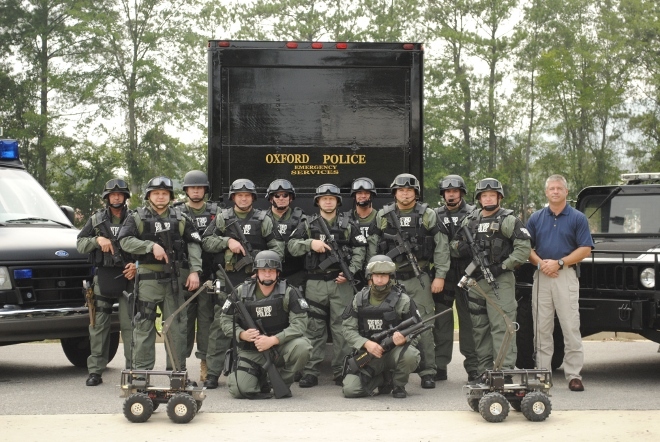 Now I haven’t been to Oxford, but unless the zombies are coming, I can’t fathom for what purpose a town of 15,000 needs “$3 million of equipment, ranging from M-16s and helmet-mounted infrared goggles to its own armored vehicle, a Puma.” That’s about $2000 of equipment per resident, paid for mostly through a federal grant program. What I found interesting is the juxtaposition of this story with the ongoing National Rifle Association conspiracy theory about the Justice Department’s “Fast and Furious” program, which stupidly funneled guns to Mexican drug cartels in a failed effort to track their activities. The NRA, which you might expect to be enthusiastic about the release of guns to the general population, instead seems to believe that the program was in fact an elaborate plan by the Obama administration to “stick more gun legislation on honest American gun owners of the United States.” The theory goes that by providing American guns to the cartels, the administration ensured that horrific drug gun violence could be blamed on the preponderance of uncontrolled weapons within our borders, thus fueling popular outrage at lax gun control laws and allowing Obama finally to unveil his secret plan to demolish the 2nd Amendment. Or something. Yet you won’t hear the NRA complaining about the federal grant program that gives automatic weapons and tanks to small-town police. In fact, the NRA has long collaborated with local law enforcement, even hosting an annual “Police Shooting Championship“, now in its 50th year. Isn’t that odd? The NRA defends the 2nd Amendment as a mechanism for citizens to protect their freedom against government infringement. What could be more dangerous to citizens’ individual liberty than a militarized police force? In the NRA’s world, the federal government is simultaneously giving away guns to Mexicans as part of a plot to restrict Americans’ right to gun ownership, and also giving away guns to American law enforcement to help us protect ourselves against the feds. The NRA just wants more weapons in the hands of Americans, whether private citizens or public officials, and despite their rhetoric, couldn’t care less about individual liberty. The NRA believes, contrary to most historical examples, that local police are a bulwark against oppression of individual liberty, not part of the mechanism of oppression. The NRA believes that local police are sympathetic to the interests of 2nd Amendment enthusiasts–that is, of disproportionately white, rural men (see photo above)–and will protect that group in particular against incursion by both the government and immigrants. The NRA cares more about politics than about its own ideology and won’t let slip any opportunity to vilify Democrats. Is there a better (and possibly less cynical) way to make sense of this? I don’t know if these words are wise enough to deserve being rendered as an image. But the question is worth considering from time to time, I think, particularly for young “writers” like myself who might not yet have satisfactorily examined their reasons for embracing the medium of written word. There’s irony in publishing this response on a blog, the form of writing which typically entails the least rehearsal, refinement, and correction.